Free typing lessons for beginners. Typing for dummies. Would you like to save time and make almost any job on a computer more effective? Would you like to write on your résumé that you are a fast typist? Would you like to reduce your error percentage when you type? Well, then you have come to the right place. Here: you can calculate your advantage in dollars of being able to type faster on your computer. People who beginners at 10 finger typing are forced to choose between either looking for the keys on the keyboard or think creatively. So - if you furthermore would like to think creatively as you type, read on. As a beginner you might want to start off by testing your current typing speed. How can I type faster? In your effort to learn to type faster, finger position is one of the most important basics. When you start on an lesson you must place your index fingers as shown at the image below. This is the starting position, and the keys ASDF, for your left hand, and JKL;, for your right hand are called the 'home keys'. 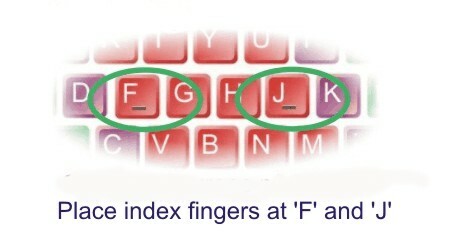 With your index fingers you can feel a bump on the keys 'F' and 'J'. 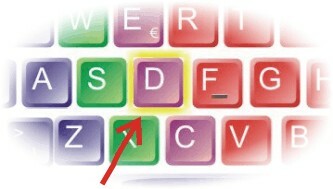 When you type you must get back to these two keys as soon as a key has been pressed on the keyboard so that you know all the time where you are on the keyboard. If you don't find the keys 'F' and 'J' again you will get lost and make a lot of mistakes. For the same reasons the first lessons are done without ever moving your fingers from these two keys. Touch typing, or blind typing as some calls it, means that you type without looking at the keyboard. To learn to do that finger position is very important. When you type you must use specific fingers for the same keys all the time as illustrated at the image above. If you don't do that you will soon loose your orientation and make mistakes. When you have found the two home keys, 'F' and 'J', you should strive to type with out looking at the keyboard. Look instead at the two hands at the virtual keyboard on your screen. Don't get frustrated if you do mistakes in the beginning. Every one does. After exercising for some time you will know by heart where the keys are and your touch typing will go much more smooth. The next key is 'D'. When you are a beginner at touch typing you should try to type with all ten fingers and without looking at the keyboard. By doing this you will of course make mistakes to begin with, but with some training it will become natural for you. Instead look at the keyboard depicted on the screen below the text. If you type the wrong letter it will be highlighted by changing the font color to red. The number of typing errors you make is indicated at the right side of the top of the screen. If you half way through an lesson press 'Repeat' the number of errors will be reset and you can start over. 2. have your thighs at level with the chair. 3. keep your back straight. 4. look at the screen in the most comfortable way, and look at an angle at about 12-15 degrees downwards. 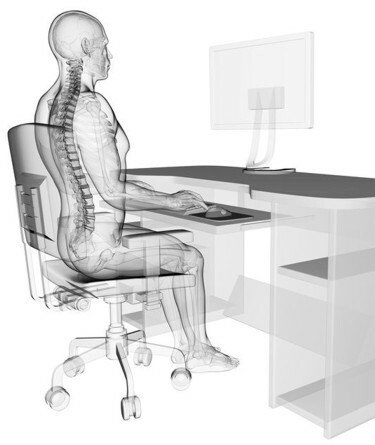 Doing this you will avoid pain in your back and you will be able to type for a long time without great strain on your neck and shoulder. A danish study has established that when kids learn how to type, their reading skills are improved. This is true even for dyslexic kids. What is the average speed of a touch typist? 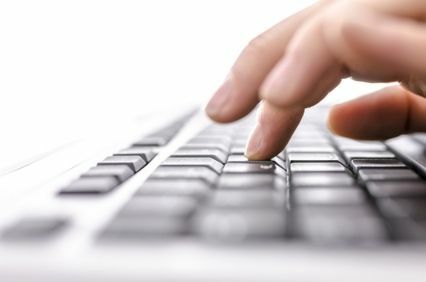 Those who use only two fingers often type as slow as 10 words per minute although some are capable of surprising fast speed with this primitive technique. After these lessons you should be able to type at least 35 to 45 words per minute. After some months of experience and regular typing you can reach 90 words per minute or even higher. As with everything else practice makes perfect. You can follow your own progress by pressing the button 'Statistics' in the top right corner, you will be able to follow your progress online after each lesson. You should do your touch typing lessons as often as you are capable of without hurting your fingers! As with everything else, regular training gives the best result. Most people will probably get the best result by distributing the lessons to several days in the week rather the doing a lot of exercises in one day. It is a good idea to put your touch type training into a calendar to be sure to remember to do them. If you don't have a calendar you can use the Google calendar which is free and easy to use. In this way it is easier to remember to do your exercises. Training touch typing is probably the only activity your employer will allow you to do at work beside doing your job. :-) How about doing some training instead of using all that time to updating your facebook account? What if I don't do all the exercises? Well you will under all circumstances be faster just from doing some of the exercises, as you will be able to find the keys much faster. Thusly it is better to do some basic exercises than none at all. Do I have to start with the first typing exercise? Not necessarily. When you hold the mouse over 'Choose lesson' you can see which keys the particular lesson is training. You can then start with the tutorial you think is the right for you. Be careful not to be optimistic about your current ability as it will lead to a too steep learning curve. Warming up for the lessons. It is a good idea to warm up your fingers before a training session. You can warm up your fingers by doing some of an lesson without caring too much about the errors, and then press 'Repeat' to get started. How low an error percentage should I aim for? It is more important to have a low error percentage than a higher speed. The low error percentage will be your best guarantee for success in the following lessons. You can follow your progress at the statistics page (just press the button 'Statistics' at the upper right corner) You should strive to do all lessons flawless (or at least with max two percent error) before you go on to the next lesson. If you learn to type flawless a high typing speed will automatically ensue. By the way, the error statistics will only save your best results. Well, then you can reward your kid for every lesson the kid has done at en error percentage at one and perhaps an extra reward for a flawless exercise. Your kid's school work will most probably benefit from being an apt typist. A lot of people type with two fingers, and thus type around 10 - 15 words per minute. After completion of this course you should be able to type at least 45 words per minute, and even faster if you type often. If you at your job type nine hours a week you will be able to save the six out of these nine hours provided you triple your typing speed. That will be nearly 300 hours saved a year or seven weeks extra holy days a year. If you have 30 years left before you go on pension the course will save you about 230 weeks work. Are you self employed you will be able to stop working four years early. Or, if you could convert your increased typing speed into a pay raise, you could get four years extra payment before retirement. Learning how to touch type is probably one of the best educations you could invest in. And it won't cost you any money. You can here: calculate your own personal benefit from improving your typing speed. How ever it works out for you, you have probably never met a person who regretted spending some time improving his or her typing speed. The only requirement for this course is that you regularly spend some time vigorously train on your computer. If you do just one or two tutorials weekly (who hasn't got time for that? ), and do them as well as you can, you can see an end to the course. You can go to the TEST page weekly or biweekly to see your progress. 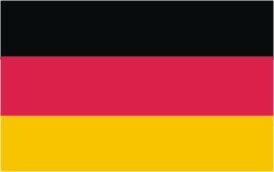 AMRAY - Free Web Directory © www.easytype.org - free blind typing lessons online course for beginners and kids on Mac and PC. All rights reserved. टाइपिंग टेस्ट	ें .